KB, Lyn and Fliss are thrilled to announce the release of BBU’s new Album ‘Weeds’! You can now purchase your CD HERE. You can purchase a digital copy HERE. It’s not entirely fair to say country music is the most conservative of music genres. In terms of resistance to change/adherence to orthodoxy you can find the attitudes even more frozen in time if you dip into the hardliners of punk, metal or what passes for indie. Country’s ability, eagerness even, to embrace soul, rock, pop, electronic and even hip hop – for good and bad – and the concurrent use of country elements in those genres (and no I don’t mean Kylie donning a cowboy hat for what was in truth a fabulous pop record and NOT a country one) makes such an easy slur hard to justify. Of course that applies more to the USA than Australia, where country is barely even a niche market, scared of its own shadow, and casts a wary and sometimes hostile eye to those who travel across genre borders, unless they embrace the traditional. Where the accusation does hold true is in the terror in mainstream country at the idea of making social commentary beyond the platitudes of noble farmers and stoic wives, brave diggers and salt of the earth/backbone of the nation/utes-and-boots etc. Exploitation of resources, indigenous rights, climate change, migrants, union bashing, health and hope? Ooh no, let’s not scare the horses or the horse floats. John Williamson is a noble exception to that rule locally, but in the main the rest live in a Kernaghan world of dewy eyed Aussieness while Americans such as Margo Price, Sturgill Simpson, Steve Earle et al speak up. Which makes this oft-gorgeous second album from the experienced and independent trio of Kevin Bennett, Lyn Bowtell and Felicity Urquhart stand out. Right from the first song too, not buried up the back where it’s safe because people might have stopped listening. In Mountain Of Pain, which begins with a kind of chain gang choral and opens up into a banjo-led quasi spiritual, there are sharp lines about “fake sophistication, gold plated living” and how “we wait in hope for the love to trickle down/It’s raining promises, everyone can see”. There are nods to those who “follow their leader and fill their cup with cruel intentions but it’s never enough” and a general sense of dissatisfaction with what passes for leadership. Soon after, in Softer Eyes, after picking at the sores of “torment and trouble, on the face of the earth”, they make the point that “talkin’ ‘bout kindness, talk about love” requires more than the words. “I know what’s right, it’s in my blood”. And the truth of that is clear in Just Down The Hall, where there’s no attempt to fix in the past appalling treatment of black Australians, and even can be discerned in the subtext of She’s Sunshine, which offers hope in nature and metaphor. This isn’t to say Weeds is a wholly political album, and certainly not right to call it partisan (though it’s reasonable to assume none of them are Trumpians or Hansonites), but even three or four songs that don’t shy away from hard talk on a record is worth noting and applauding. It’s also worth applauding the pleasures of Weeds, of which there are many. There’s its ability to sound simply arranged (when in fact each song is a tightly set package) and its sense of when to pull back to essentials, as in Lonely Wongawhich in its voices-and-barebones-percussion presentation would not be out of place on a Rhiannon Giddens album. 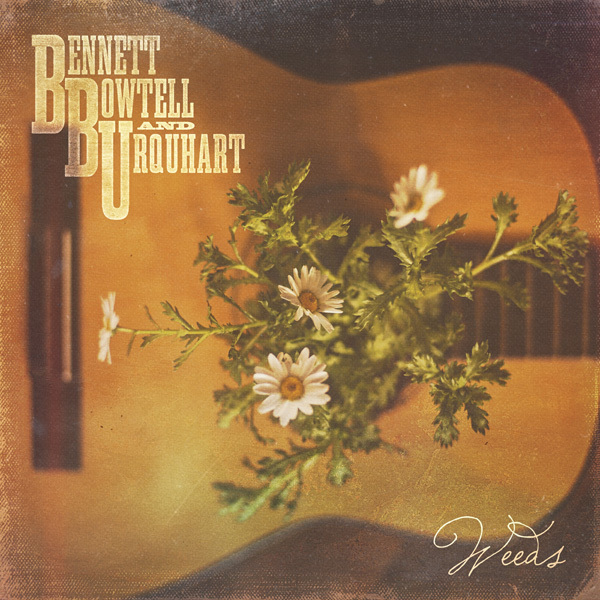 There’s the lovely interplay of guitar, banjo and ukulele, which matches the interplay of their three voices: Urquhart’s gossamer, Bowtell’s crystalline and Bennett’s grainier. And there’s the blend of bluegrass and string band, harmony sweetness and church intensity, backporch country and folk wanderings. Most of all there are gently easing into the world songs such as Fading Out next to perky spins such as Any Bells, and California pop children like She’s Sunshine on the same disc as gingham-and-lace moments such as Mystery. And there’s a sweet appearance by Karl Broadie, whose life crossed many borders and whose death touched more, in the album’s pretty closer, Every Hello. It’s clear that Weeds is a record comfortable dipping into the past but positioning itself in the present: stylistically, sonically and topically. Brave? Maybe. Good? Definitely.